Here’s a look into the three biggest trends in cocktail ingredients of this year, as revealed by some of the incredible mixologists who contributed to our upcoming book, F&W Cocktails 2015. Last year’s liqueur of the moment, Cherry Heering, has given way to the tropical banana liqueur (also called crème de banane). Revived by companies like Giffard, which eschews artificial flavoring and instead makes it with actual bananas, the spirit is sweet, caramel-like and packed with fresh banana flavors. Predictably, it’s most commonly used in tropical, rum-based cocktails. Sara Justice of the Franklin Mortgage & Investment Co. uses it in the Psychedelic Jungle, a sweet and spicy combination of Beaujolais, raspberry syrup and jalapeño. But it’s also a great addition to non-rum cocktails like Pamela Wiznitzer’s whiskey-based Fortitude—a dark and boozy cocktail that also includes sherry, allspice dram and balsamic vinegar—at New York City's Seamstress. 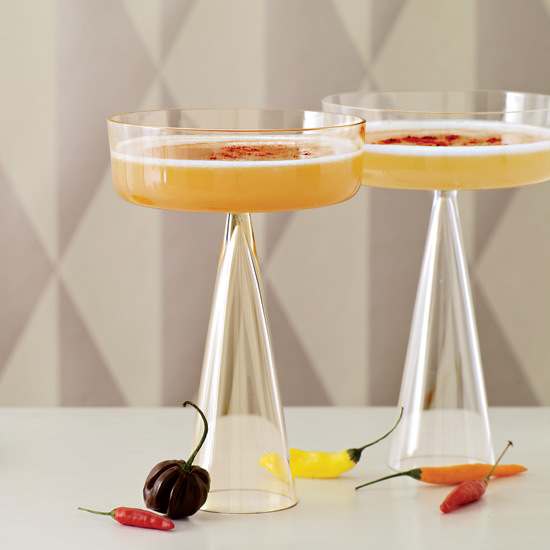 Muddled with simple syrup, shaken in a cocktail or concentrated into an extract, chile peppers are now a must-have in a bartender’s mis-en-place—and not just for their heat. "Peppers have a lot of different flavors and a lot of different aromatics that you can use to build structure into a drink,” says Jay Schroeder of Chicago’s Frontera Grill and Topolobampo. His tequila-based To Alleviate Apparent Death calls for guajillo, “a leathery pepper,” while Chris Lowder uses Thai bird chile-infused Cointreau to add “bright, clean heat” to the brandy-based Holy Roller at NYC’s The NoMad Hotel. Tina Ross of LA’s Harvard & Stone likes to use cayenne extract in the Firesuite because of its spicy, earthy and vegetal flavors. She adds just a few drops of the potent liquid to a mix of Pimm’s No. 1, gin, fresh lime juice, ginger syrup and club soda. From infusions to concentrates to garnishes, flowers are inspiring bartenders everywhere to make new, unusual and delicious flavor combinations. For example, while you probably don’t associate the smell of Scotch with lavender, Jacyara de Oliveira of Chicago’s Sportsman’s Club says that the spirit does contain subtle notes of the fragrant flower, and the two ingredients taste incredible together. She mixes lavender bitters with Scotch, vodka, Velvet Falernum, lemon juice and honey syrup to make her Of Mountains and Valleys. For extra complexity, Sara Justice infuses rum with jasmine green tea to use in the Cross-Eyed and Painless, a riff on a martini made with sherry and crème de noyaux (almond-flavored liqueur).